It’s that time of year for Holiday Parties, Family Photos, and celebrating any big moment in life! We had the opportunity to shoot with Tawny, who is 32 weeks pregnant and radiant, to put together this look book for the Holiday Season! Our Cozy Winter Sweater ($41.50) is the perfect top to wear this season! Oversized sweaters are a great go to piece to wear when you are expecting and the neutral color block is a classic, timeless style that you’ll be able to pair with anything. Plus, you can wear this top comfortably after you give birth! Now these jeans have been tried and loved by anyone and everyone that has put them on! Not only is the waistband suuuuper stretchy, but the magic of these pants is that they are actually SPANX! The SPANX material helps you feel put together while being comfortable! **These are a great option for Thanksgiving!! No need to unbutton your jeans at the end of the meal when you have a stretchy waistband!! Pair our Cozy Winter Sweater and SPANX Ankle Jean-ish Legging ($98.00) with a chunky heel like our Mariko Oatmeal V Cut Heel ($37.50) and you have the perfect outfit! Need a dress for the Holidays? Our Juliette Dress (Available in Two Colors, $56.00) is a great option! The metallic gold pinstripe gives the dress a festive look, the empire-waist is perfect if you have a bun in the oven, and the balloon sleeve with the ruffle sleeve adds a feminine touch! 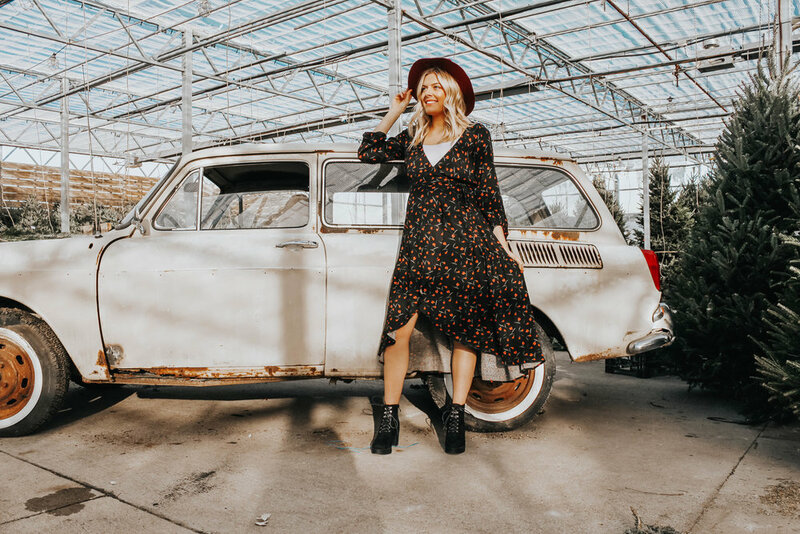 The Boho look is a great trend for any woman that is expecting and the draping effect is a perfect style keeps the look of the dress after your baby arrives! Two Words: WRAP DRESS! This should be a staple in everyone’s wardrobe. The benefits of a wrap dress are endless: wear it during or after your pregnancy with ease with the ability to adjust how tight or lose you tie the dress, wear it as a kimono by tying the straps in the back, dress it up with heels or dress it down with some cool combat boots, need I go on?? Side Note: Our Goldie Chunky Combat Boot (Available in Black and Grey, $48.50) have been tested and approved as the go to shoe if you are going to be on your feet for a long period of time! 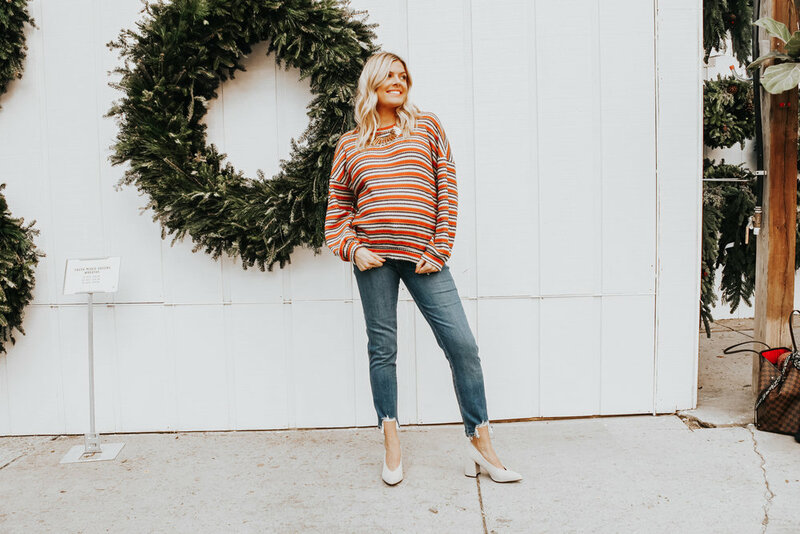 Make a statement this Holiday season in our boldly striped sweater (Harper Striped Sweater, $42.00) while staying warm and cozy! This top is great to wear with a pair of jeans, like our Light of Day Skinny Jean ($80) and a pair of heels (Mariko Oatmeal V Cut Heel, $37.50) or rock it with some leggings and booties for a more casual look! If you didn’t know already, we have a thing for jumpsuits here at beyourself. Ones like the Sienna Plaid Jumpsuit ($49.50) are a perfect way to feel comfortable while going from one Holiday gathering to another. Layer the You’re The One Crop Top ($34.00) underneath and you are good to go! 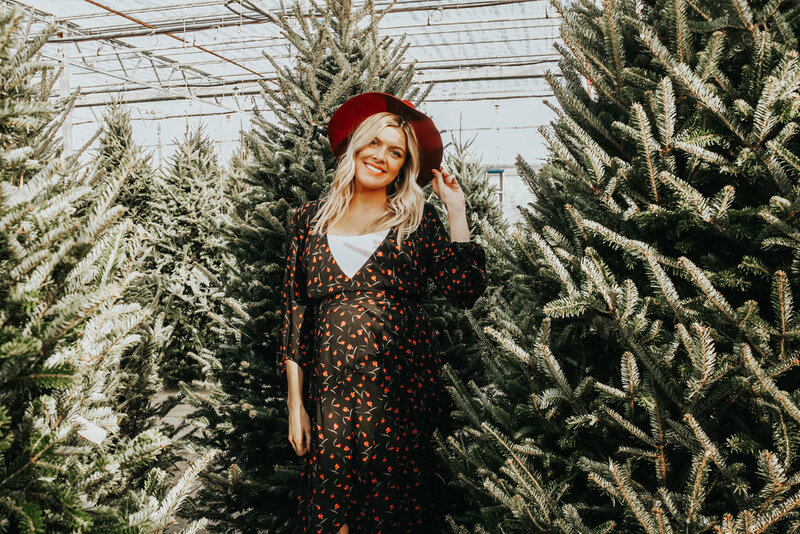 We hope that you got a couple of ideas for ways to show off your baby bump this Holiday Season! 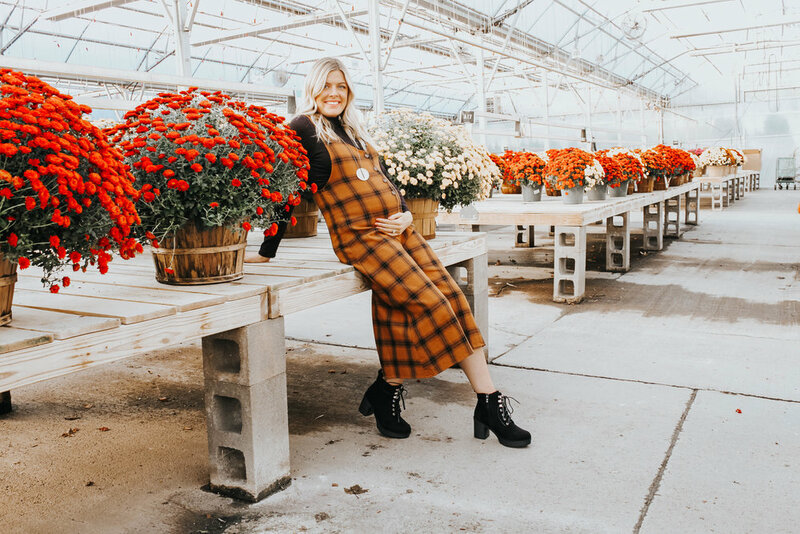 We just wanted to show all of the newly pregnant women that come into our store that they don’t; necessarily have to wear maternity clothes or think that they cannot shop at beyourself because of their baby bump! (Owner, Jennie O’Dell wore only beyourself clothes during both of her pregnancies.) It is all about finding pieces that make you feel comfortable and confident while you’re pregnant and ones that you can keep wearing after you give birth to your bundle of joy! So, stop into either beyourself store and we would LOVE to help you find an outfit for any occasion that makes you feel confident and good about yourself!